Please remember we will be closed today. post number of rounds to comments. Disclaimer: I have been getting a ton of questions about this topic from both inside and outside the gym, from lots of different people, so this isn’t directed at anyone in particular. Although, if this topic resonates with you, take the time to read it. This post is more a psychological and analytical approach to body image, Sean has the scientific approach in the comments. Lean – having little to no surplus fat – Thus, to look “lean”, you need to have low levels of body fat. Toned – seeing muscle definition on a human body – Thus, to look “toned”, you need to have low levels of body fat combined with having enough muscular development that you can see the shape of the muscle under the skin. 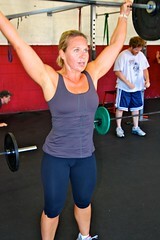 This is usually accomplished at below 20% body fat on women, and below 10% on men. On the left, we have a runway model who has almost zero muscular development while also having almost zero fat deposits. She has enough essential muscle to not fall over walking, but not much more. If you want to look like the woman on the left, sorry, but we cannot help you get there. Although, if you have an apple and a cigarette a day for about a year, you could get close. It supposedly worked for Christian Bale in the Machinist. 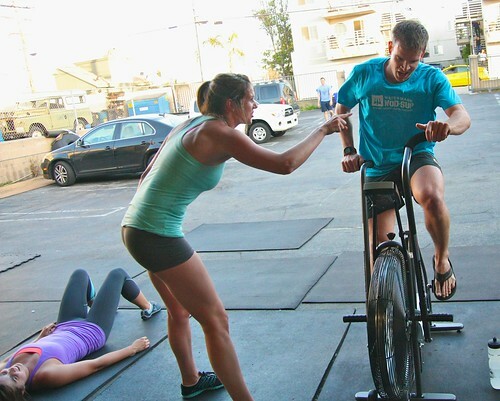 However, CrossFit South Bay will not help you create that type of body. The female on the right has spent years developing her strength and muscle. She has battled heavy weights and pushed herself to the limit to squat, deadlift, and lunge heavier weights every time she comes into the gym. She weighs approximately 35-40 lbs more than the runway model due to the large amount of muscle that she has acquired. She is likely approaching her genetic limits in the amount of muscle she can develop without going on a bodybuilding routine. Between her and the runway model, there is likely very little difference genetically, yet there is a huge difference in training and diet (more on this shortly). Some people keep saying to be leaner they just need more cardio and less strength. Well, yes, if you just do “more cardio”, you will lose more fat, but you would also lose muscle because without strength training, your body burns muscle as well as fat. So, instead of looking more like a Victoria Secret model, you start to look more like a runway model. Then, once you stop doing “more cardio” you will gain fat even faster now that you don’t have the muscle to burn the extra calories, resulting in the “skinny fat” look. You can see this in ex-athletes that have tried to “get leaner” by doing “more cardio” only to result in having more fat with less muscle. 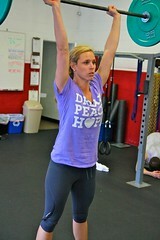 Come train with Monique Gaxiola, #13 of the LA Temptation, here at CrossFit Chatsworth!